Thus, the position reached by the gun when it is fired at 0.050 second is 0.8050— .0364=.0441 foot from its most forward position. The velocity with which it reaches this position is approximately 7.3 feet per second. As previously explained, these values differ slightly from the original estimates but are close enough for present purposes. With the cycle time of 0.050 second, the rate of fire is 1200 rounds per minute as required. In conclusion, it should be noted that the curves shown in fig. 3-34 represent the motions which occur after a burst is in progress. The conditions for the first shot in a weapon which uses advance primer ignition require special consideration. 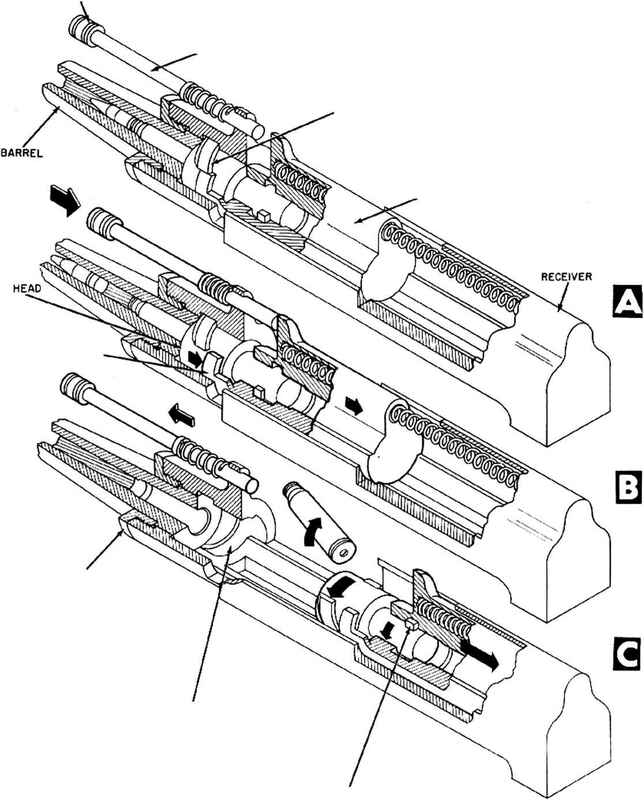 Since the action in this case is based on a forward velocity of the gun at the instant of firing, the charging mechanism must be arranged so that the effect of advanced primer ignition is obtained for the first shot. If this is not done, the first recoil will be cxccssivelv violent.